Atatürk World Platform (ADDP) was established in 2016 with the initiative of the Atatürk Thought Association (ADD) Headquarters in Ankara. Atatürk Society of America is one of the founding members of ADDP. 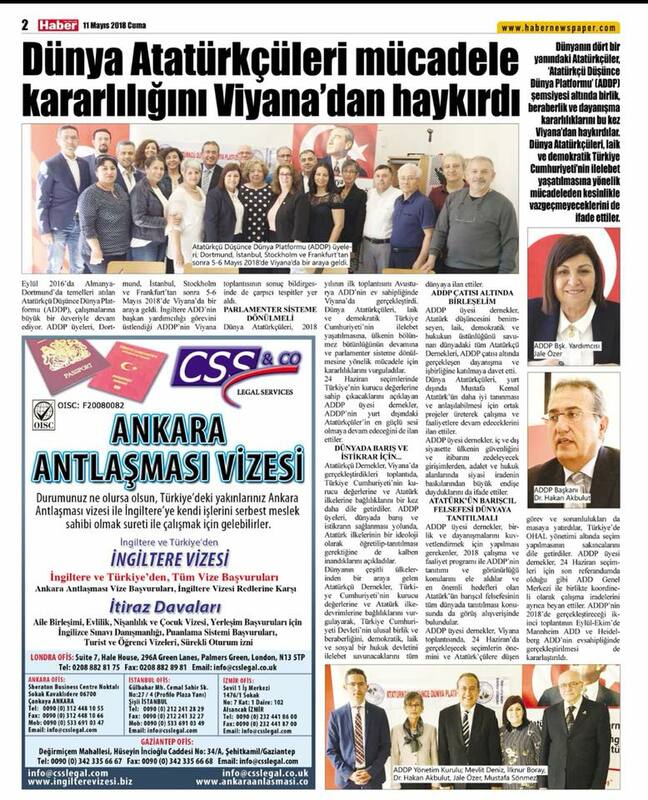 Atatürk ists around the world, who were concerned about the domestic and foreign policy developments in Turkey in recent years, decided to unite to fight for the return to the parliamentary system, the continuation of the territorial integrity of our country, and to keep secular and democratic Republic of Turkey forever alive; and on September 18, 2016, they met in the German city of Dortmund and established the Atatürk World Platform/ Atatürk cu Dusunce Dunya Platformu (ADDP). The meeting was hosted by Dortmund ADD. After the initial meeting in Dortmund, the first annual meeting of the ADDP was held in Istanbul on 17-19 March 2017. In attendance, there were representatives from Atatürk’s Associations operating in 12 countries around the world. The Istanbul meeting was hosted by Municipality of Kartal. ADDP’s Executive Board was elected at the meeting in Istanbul: President Hakan Akbulut – Deputy President Jale Ozer – England ADD, Deputy President Mevlit Deniz – Hessen ADD (Dortmund ADD as of April 2018), Principal Uymaz Mustafa Sonmez – Isvec ADD, Secretary General Ilknur Boray – Atatürk Society of America. After the Istanbul meeting, member associations of ADDP met in Stockholm, Sweden on June 9 – 11, 2017. The meeting was hosted by Isvec (Swedish) ADD and 16 member associations participated in the meeting. ADDP’s 4th meeting was held at the historic Kurhaus Hotel in Bad Kreuznach, Germany, on 30 September-1 October. Mustafa Kemal Atatürk stayed at the same hotel 100 years ago in 1917. The meeting was held in the Atatürk Room of the Kurhaus Hotel. Representatives from 12 member associations in 10 countries attended the meeting which was hosted by the Hessen ADD. The first ADDP meeting of 2018 took place in Vienna, Austria on May 5 -6. The host association was Austria ADD. Representatives of associations from Turkey, Austria, Germany, Sweden, Britain, the United States and the USA attended the meeting. The next meeting of ADDP will take place in the Fall of 2018 in Germany. The host associations will be Mannheim ADD and Heidelberg ADD. 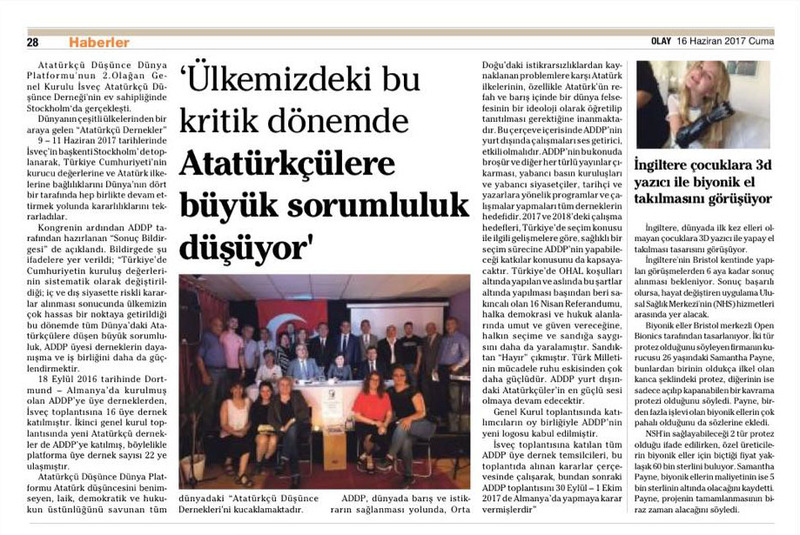 Members of the ADDP believe that the principles of Atatürk must be introduced and taught around the world as an ideology, in order to achieve peace and stability around the world. ADDP is determined to forever defend the founding values of the Turkish Republic, as well as its democratic and secular principles.